Business Continuity, a crucial aspect for Mission Critical infrastructures, is ensured by a UPS which avoids data losses and downtime. As any other machine, the UPS is not faultless and unpredictable anomalies could affect its performance, impacting negatively on your business. How do you make sure your business is continuously protected by your UPS and what can you do to minimize the risks of downtime? critical infrastructure and avoid costly downtime. Socomec installed UPS and the nearest Socomec Service Centre. 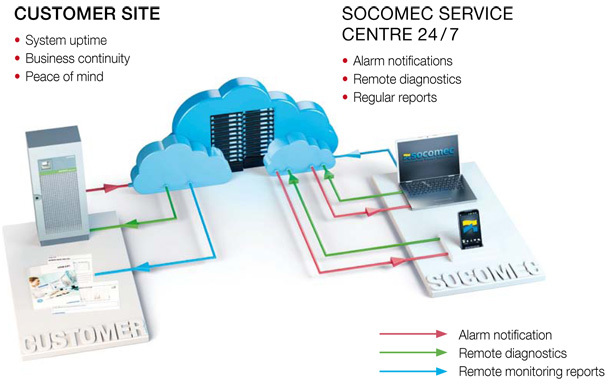 If an anomaly occurs in your UPS, the system will automatically notify the nearest Socomec Service Centre. 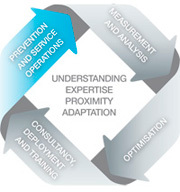 A specialist Service Centre engineer will carry out a diagnostic check by remotely accessing the parameter dashboard and perform the most appropriate corrective action. LINK-UPS monitoring system keeps you updated about the operating status of your UPS, providing you with regular reports and technical recommendations for improving the quality of your system.